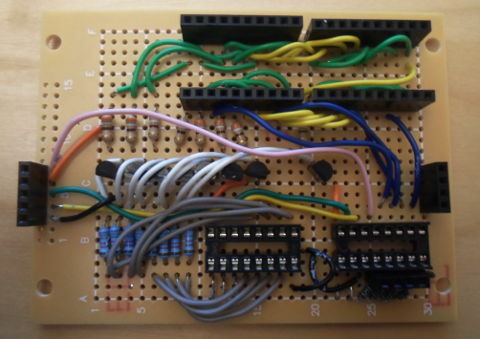 This circuit provides a four-number 7-segment LED display which is controlled via an I2C interface. 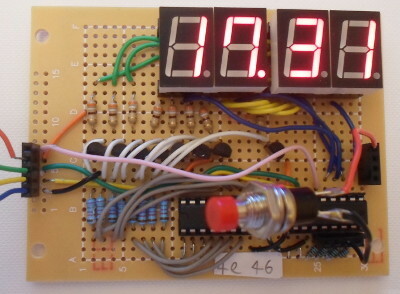 It was originally intended to be a 7-segment LED version of my LCD-based timer, but as due to how things turned out was scope-reduced to just being an I2C-driven clock display, with the timing functionality omitted. Most of the work was done over 2 days, and this was in part an exercise in seeing how I would cope with tightly-packed boards. Although the use of receptacle headers in the top-right means that the LED modules (Farnell 2627645) are not permanently attached to the board, the primary purpose of using them is to provide clearance for the wires below. Given limited space, putting wires underneath the LED modules was a necessity. I settled on my usual 5 volts for the circuit Vcc because that is what most of the components I had in stock are rated to use, although as-built this circuit will also operate at 3.3 volts. I opted to use 390&ohm; resistors to limit the LED segment current because it is a standard value I use with LED, and hence have a large quantity of them in stock. The 12.8mA they would allow was a bit over half the 20mA the data-sheet recommended, although it was not clear whether the latter was per-module or per-segment. It was something I decided not to put much thought into at the time, although in hindsight I suspect it is per-chip. From what I could make out from the data-sheet, the PNP transistors have a gain of around 150 with collector currents in the 10mA ball-park, so I opted for a base current of 0.1μ which would have allowed 15mA to flow through the LED modules. However the nearest value of resistor I had was 78.8k&ohm; which nominally would have only allowed a nominal collector current of xxxx, but in practice I could not tell any difference in brightness. The inputs to the PNP transistors and the ground pins from the LED modules require current sinks and the original plan was to use NPN transistors, but since it became apparent there was not enough room for them, I instead used two PCF9574 expanders due to them having open-collector output. It is supposed to sink a maximum of 10mA per pin, although I was not aware of this when I designed the circuit. The four pins on the right-hand expander that are not used as LED chip current sinks are used as connections for user-input buttons, and these have 2k&ohm; pull-up resistors attached, the intention being that button presses ground the pins. The choice of pull-up over pull-down was due to where power rails ran, and I opted for 2k&ohm; resistors due to the small size of the ones I had in stock. As can be seen from the image below, the board is pretty packed out. There was one short-circuit between two of the 77k7 resistors in the bottom-left and there were two or three solder joints that had poor conductivity, but given the density of things on this board I consider that to be quite good going — I think it took only half an hour or so to track down & fix them all. The PCF8574 does not have any internal configuration state and all eight pins are read/written at the same time. However on a write any pins that are intended to be inputs have to be set high, which for the open-collector output means the “off” state of high-impedence. In practice means the corresponding bit in the data byte needs to be set to 1 — if it is set to zero, the subsequent read will get this value regardless of what the input is. For reasons I was not able to trace, reading did not work in a lot of circumstances I expected it to, most notably if the output-only expander was also being written to. With just the commands for the one expander being sent, all seems to work as expected. This seems to be the case even with the LED chips removed, so I don't think it is a simple issue of sinking too much current. I decided to forego programming a microcontroller to do the actual timing. The following Python code will drive a USB-ISS to output the I2C commands that will display 17.31 on the LED chips. For completeness it retains the button reading code, but it only seems to work properly if the first two i2cSend() calls within the innermost loop are removed. The USB-ISS can supply upto 80mA, so it is capable of powering the circuit. While this circuit was not an outright failure as display functionality was fully operational, and I considered making a small daughterboard that contained just an 8-pin microcontroller that could hang off the external interface, I felt that pushing ahead to the original goal of a working timer involved too many imperfections. Ultimately it was realisation that I was exceeding electrical limits of some components, even though I could not see any definitive connection between this and known faults with the circuit. I was simply not in the mood to convert my Python script into firmware and workaround the input issues, as this project was intended to be end-product orientated rather than investigative.